Festool is known for their high prices. In some cases, I believe these prices are unjustified. I recently spent a few hundred pounds on the Festool jigsaw and I ended up using my £60 jigsaw, that didn’t cut straight, instead of my new Festool jigsaw. When I am ripped off with tools, I am keen to talk trash about it. However, when I get value for money, I also like to shout it to the rooftops. Normal (cheaper) ‘random orbital’ sanders don’t have this feature. They typically only have the normal orbital motion in which the pad oscillates, but it doesn’t spin. It is free to spin around whichever way it wants, but the motor doesn’t spin the disk. This is a very delicate sanding motion, used to produce the finest finishes. There is no doubt that this oscillating motion does produce an exceptionally fine finish, and is a vital asset in the professional refinisher’s toolkit. The Festool Rotex RO 150 brings something else to the table, however. It has a Geared Orbital motion. The Geared Orbital motion both oscillates AND rotates the disk. This setting is extremely aggressive, as far as handheld sanders go, while also producing a very fine finish. Not quite as fine as the oscillate-only motion, but it is literally the next best thing. Much smoother and finer than an edger can produce. If your goal is to produce a finish good enough for staining in record time, this is the tool. I recently purchased a new Festool Rotex RO 150 (along with an R0 90 for those tight areas). I thought the Rotex I had for 5 years, working day-in and day-out had finally died. I had started to get noisy and I had been thinking that I may need to replace it soon. All of a sudden, it stopped working. I tried other leads (Festool leads are interchangeable), but unfortunately, it seemed this little Rotex’s time had come. I bought my new Rotex, loving the clean sleek unused look, and continued sanding to my heart’s content. Later, I recounted my recent loss to my local tool merchant. He asked me to have a look at it, and I obliged. As it happens, the Rotex had stopped working due to a £10 part at the lead end of the machine. He replaced it and it was back up and running! I sold it on eBay for £100. Can you believe that? A hand tool that has worked almost every working day for 5 years, often with my whole 230lb weight bearing down on it, only needed a £10 part to get it going again. I have to take my hat off to them this is real quality. One thing that I value highly is ease of use. 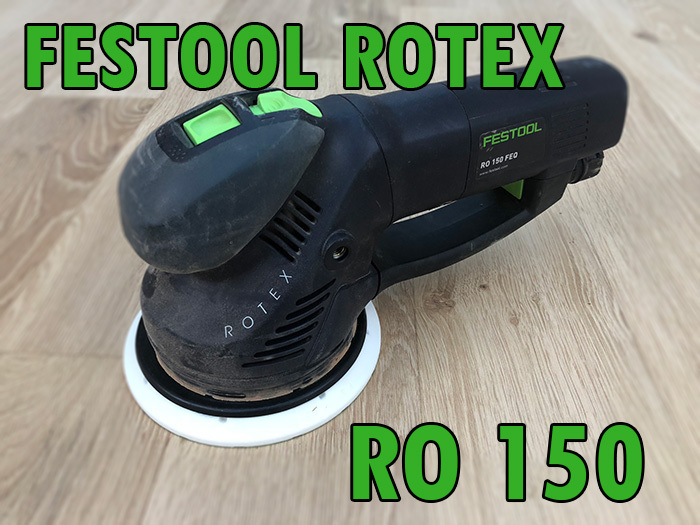 The Festool Rotex RO 150 is a very versatile and useful sander. Nothing gets the job done quite like it in a small area, but it is also very simple to use. This is the pinnacle of great design. You put on the abrasive, you plug it in and done. You’re ready to go. It has 2 settings, one is the oscillating only setting, the other is oscillating and rotating setting. Then there is a speed setting at the tail of the tool, next to the cable. You could set the speed to the middle setting and forget about it for the most part. Anyone could pick this tool up and start using it. On floors, doors, tables, furniture, any wood you can find with a flat surface on it, this thing will work a treat. 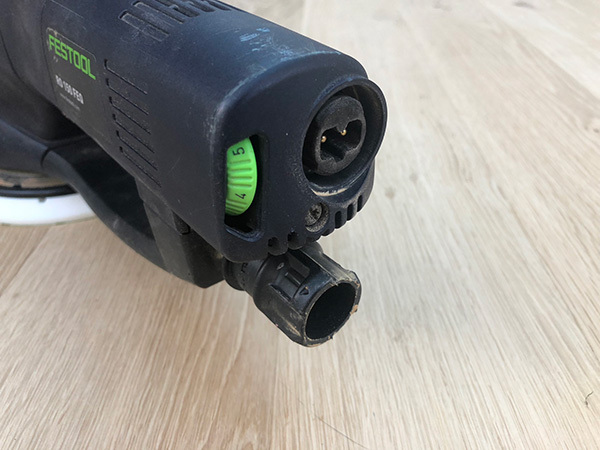 As you can see in the image above, the Festool Rotex pad has multiple holes in a pattern all around the disk, which feed through to the dust extraction outlet on the back of the tool. Even with cheaper dust extractors, I have found the extraction of the Rotex to be absolutely top notch. The only time it struggles to contain the dust is when you have it on a step, for example, and half of the Rotex is overhanging the edge of the step. This means it doesn’t have complete suction and it does spill a little dust, but even then you will find its very minimal. When used on floors, it’s absolutely superb. If you want to check out and/or buy the Festool Dust Extractor then click here (this is an Amazon affiliate link that should work for both the US and the UK). However, if you are looking for more of a budget extractor then I can recommend you check out this little beauty. As I previously mentioned. The quality of the sanded surface produced by the Festool Rotex RO 150 is marvellous. While there are some edgers that can produce a very smooth surface when using 100grit, you would also need a seasoned pro who is very in tune with that machine, and a floor that is almost completely flat already, in order to produce a surface that can be stained without any scratches. Whereas the Rotex can smooth over a lumpy floor, or a floor that ramps up toward the edges of the floor (has been sanded a few times before). Furthermore, you don’t need to be a hardwood flooring veteran in order to use it. It can take that very rough sanded edge and smooth it into a flat, scratch-free surface that is ready to take a stain. The reason I keep mentioning stain is that stain highlights scratches! You know when you have sanded the floor to perfection when you put a stain on it and you don’t see any scratches, just wood grain. Producing a high-quality finish like this can be expected from most random orbital sanders. The value of the Rotex is that it has exceptional power in combination with exceptional quality. Normal random orbital sanders can be very slow and tedious. They just don’t have the oomf to get the job done quickly. 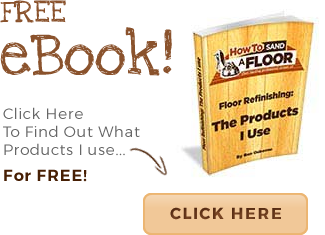 This is especially important for those of you who are planning on sanding and refinishing hardwood floors by hand tools. Sanding a whole floor with a Rotex is hard work, sanding a floor with a normal cheap random orbital is torture. The benefit of using the Festool Rotex over handheld belt sanders (also fairly powerful) is that the belt sanders don’t produce a fine finish and they cannot get close to the edges of the floor. If you turn the belt sander sideways at the end of the boards then you are ripping scratch marks against the grain. The Rotex covers the whole floor (apart from the very corners), while also producing a great finish and doing it very quickly! At least as far as handheld sanders go. I use the Rotex mainly for the final sand around the edge of the floor. I also occasionally use it for sanding steps, thresholds and the like. If I had to say something that I don’t like about it, that would be that it’s a little bulky and it isn’t great for getting under some low radiators and kitchen units (sometimes it does sometimes it doesn’t. Also, getting further than half an inch under very low units, the disk only sticks out about half an inch. This is handy but it would be great if it could stick out a little bit more (basically have a smaller head). If you’re interested in buying the Festool Rotex RO 150 on amazon then click here! 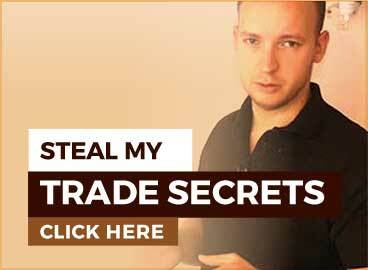 This is an Amazon affiliate link that should work for the US and UK. I hope you found my review helpful, or if you have any questions you would like me to answer then please leave a comment below!